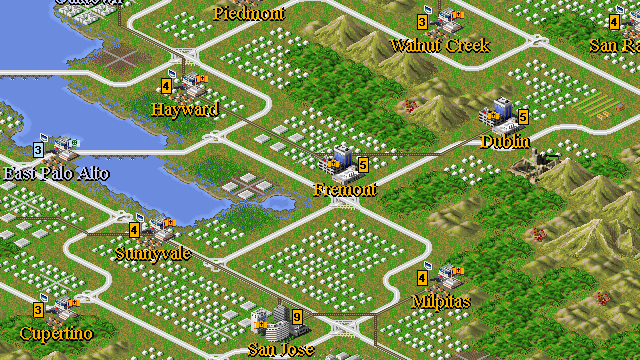 A scenario for Civilization II: Multiplayer Gold Edition by Smiley. Since their seizure of power in the United States after the rigged 2012 Elections, the House of Bush has embarked on yet more of foreign adventures. This left them overstretched and have allowed local governments to resist the implementation of the Contract on America. However, with the Nucular Option having been used in the Middle East, Jebusland is noticing this little itch on its left side that is Northern California. Several tank divisions were rolled in to scratch it. From bases in SoCal, the Jeebs made it within sight of San Francisco before their gas ran out. Lord Karl Rove is currently mobilizing more troops and supplies. Fuel supplies are being stocked now, and we anticipate hella tanks to be moving in from the east in a little over half a year. But dude, there's some good news too. Our engineers have figured out a way to run tanks on a mix of soy sauce and beer. All they need are some machines at the New United Motor plant in Fremont. They suggest we take Fremont as soon as possible. As a side note, the engineers would also be pleased if we can free Lucas so the next Star Wars movie may be finished. Word is up that he's being held hostage at his ranch in Mill Valley. Before you start charging into battle though, be aware that antiwar sentiments are still as strong as ever, and you'd be best to use brains rather than brawn. But I don't have to tell you that now, do I? 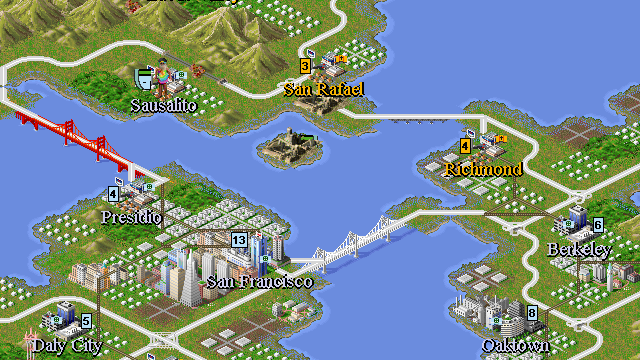 Once we've gotten a foothold, we'll need to build up our cities fast, because this one's going to be for the long haul.